1. Capt. Side altimeter indication erratically showed a descent and a lower level and back to normal indication at FL380. 2. During approach @ 1000' AGL the A/C starts rolling to the right with the autopilot engaged. 3. During approach at 8600 feet, altimeter rapidly descended and returned to normal causing autopilot to revert to CWS "P", L-NAV remained engaged. 4. After take-off, altitude and vertical speed indicator on both PFD's showed an erratic and exaggerated indications (moving up and down very rapidly) for about 2 sec. and then returned back to normal. The report states that maintenance action was performed and no reoccurance of same faults. Maintenance action consisted of BITE checks with no faults founds and thereafter ground-tested serviceable. Got to love “Ground Tested Serviceable”. I think a thorough review is required of the parts suppliers and overhaul shops who deal with the Boeing Max and these airlines. Apparently both AOA vanes on the Lion Air and Ethiopian aircraft were refurbished by the same Florida company (Xtra Aerospace) with some 85 reports of similar failures from current Max operators on components overhauled by them. The two recent fatal crashes and subsequent grounding of Boeing’s 737 MAX have prompted the jet maker to sharply and quickly cut production in Renton from the current 52 airplanes per month to 42 per month, signaling that a return to flight isn’t expected soon. Boeing said it does not plan any layoffs due to the rate reduction, which begins in about 10 days. Managers are informing employees of the Renton 737 factory at meetings on Friday. The move will hurt Boeing’s cash flow this year, putting more pressure on the share price, which has dropped 9 percent since the second crash, Ethiopian Airlines Flight 302 on March 10. Boeing announced the news of the production-rate drop moments after the stock market closed Friday. About 12,000 people work at the Renton plant where the 737s are assembled. The plant now mostly produces the MAX model, with a fast-dwindling number of older-model 737s rolling off the line. In February, Boeing delivered 20 MAXs and just 14 older models. Boeing makes rate-change decisions like this only reluctantly, because the impact on suppliers is severe and the whole production system will be disrupted unless all the suppliers can act in unison. So Boeing typically changes the rate only when it knows it can maintain the new production pace for at least a year or so. In this case, Boeing is calling the rate reduction “temporary,” its extent dependent on how long the MAXs are grounded — which is unpredictable. However, the move suggests Boeing anticipates a prolonged grounding lasting months. Obstacles to resumption of flight include both technical fixes and regulatory approvals from a global community of aviation-safety agencies that have grown more skeptical of both Boeing and the U.S. Federal Aviation Administration (FAA). The 737 production system is such a well-oiled, efficient machine — it has gradually accelerated production from 27 jets per month 20 years ago to 52 per month today — that it can accelerate or slow down only in very carefully choreographed phases. Every rate increase requires a synchronized step up by the entire supply chain, whether it’s a company supplying tens of thousands of small fasteners or one delivering dozens of whole fuselages. It has to be meticulously planned so that raw materials and labor are in place to handle the extra work. Each step up means more money coming in, which is part of each supplier’s business plan many months ahead. This rate decrease will require suppliers to correspondingly step down, meaning a hit to their business as well as potential layoffs. Hardest hit will be Spirit AeroSystems in Wichita, Kansas, which makes the complete fuselages for all 737s and sends them by train to Renton. Spirit must quickly adjust its own pace to build 10 fewer fuselages per month. Likewise, CFM International, which provides the new LEAP engine on the MAX, will have to deliver 20 fewer engines per month. But since CFM was struggling with the steep production ramp up of these engines, which are delivered to both Boeing and Airbus, the slowing of its pace may actually be a welcome chance to get back on track. Bergman, the Boeing spokesman, said that because of the complexity of the 737 supply chain, once the grounding is lifted, production in Renton will have to ramp back up “in a phased approach.” That could mean some months. It’s likely that once Boeing does get the go-ahead from the FAA and foreign regulators to begin flying the planes again, it will first ramp up to 47 jets a month and get that pace running smoothly before moving back up to 52 per month. And when it does resume deliveries of the MAX, it will take Boeing many months to catch up on the delayed deliveries to airlines. It may shuffle the delivery schedule to try to accommodate airlines that need their planes sooner, asking others to wait longer. Moving around the delivery schedule should be made easier because some airlines are now wavering on whether to defer or even keep their orders for the MAX. Some will want to hold off taking their airplanes until a successful re-entry into service has overcome anxiety among the flying public about the plane’s safety. A resumption of higher production will depend on how long it takes to get approval from the FAA and foreign regulators for Boeing’s proposed software fix to the MAX’s flight-control system and accompanying pilot training. “We’ll have to monitor as we go,” Bergman said. Other issues will also need addressed before the grounding can be lifted. The preliminary investigation into the Ethiopian Airlines crash last month revealed that it had essentially the same cause as the Lion Air crash in October: a failed angle-of-attack sensor that measures the angle between the wing and the oncoming airflow fooled the flight computer into thinking the plane was pitched too high and triggered a new automatic flight-control system that pushed the nose of the jet down repeatedly. But the sensors in the two accidents apparently failed in different ways. So in addition to the software update for its new Maneuvering Characteristics Augmentation System, or MCAS, Boeing will also have to find out how those sensors failed. Airlines must also be satisfied before the MAX can fly again. In an interview Thursday on NPR’s “All Things Considered,” Ethiopian Airlines Chief Executive Tewolde GebreMariam said he’s undecided on whether the carrier will stick with its Boeing order for 29 MAX airplanes. CEO Muilenburg said Boeing is “coordinating closely with our customers as we work through plans to mitigate the impact” of the production cut. In a note to clients last month, Ron Epstein, an aerospace-industry analyst with Bank of America, estimated a three- to six-month grounding is likely. The 737s that continue to be built will still have to be parked all around the Puget Sound region until the grounding is lifted and deliveries resume. The news of the sharp rate reduction seems to place out of reach Boeing’s publicly stated goal of increasing 737 production later this year to 57 jets per month. That will have a competitive impact because Airbus is ramping up to build 60 single-aisle jets per month by mid year, including its rival A320 family of jets and its new A220 models. It has ambitions to hike that to 63 per month in subsequent years. The higher rate allows Airbus to offer airlines earlier delivery slots. The main barrier to increasing its production has been the availability of LEAP engines, so the slowdown in supplying those engines to Boeing may even help Airbus ramp up more quickly. On Friday, Bergman said he has “no information” about any change to the plan to ramp up to 57 per month. But Boeing cannot really plan for that without more clarity on when the grounding might be lifted. We’ve often kicked the can around this forum about what it means to be an “experienced” pilot and many have offered an opinion. In my opinion, experience is about more than knowing which buttons to push and where to point the nose. It’s more about instinctively knowing whether the information your brain is receiving is correct or incorrect and then how to respond, or not. A non-experienced pilot might respond to a 74.5° AOA by lowering the nose, while an experienced pilot would instinctively reject that AOA as an impossibility and seek an alternative source of information. What angers me most about what I’ve read so far is not that the MCAS system takes it data from a single source (although that’s bad enough), but that the smarty pants engineers at Boeing designed a system that would respond to what was clearly erroneous data. Seriously, can anyone here think of any possible scenario whereby a commercial airliner could physically achieve a 74.5° AOA while still being intact? Designing a system such as the MCAS with a single data source is inexcusable. Designing it to respond to parameters that are physically impossible to achieve is criminal. I believe they call that the Cobra Maneuver. Pretty much limited to F22s and the like. LOS ANGELES—As the investigation continues into the causes of the Mar. 10 Ethiopian Airlines Boeing 737 MAX accident, sources close to the probe say flight data recorder (FDR) data firmly supports the supposition that the aircraft’s left angle-of-attack (AOA) sensor vane detached seconds after take-off and that, contrary to statements from the airline, suggests the crew did not follow all the steps for the correct procedure for a runaway stabilizer. With the stick shaker active, the trace indicates the crew pushed forward on the column to counteract what they believed were indications of potential approach to stall. The aircraft, now in level flight, also accelerated rapidly as its power setting remained at 94% N1 thrust used for take-off. This was followed by some manual trim inputs using the thumb switches on the control column. Seconds after speed advisories were heard, the crew raised the flaps. With the autopilot turned off, flaps up and erroneous AOA data being fed to the flight control computer (FCC), the stage was set for the MAX’s maneuvering characteristics augmentation system (MCAS) to activate. This is indicated by approximately 8-sec of nose-down stabilizer movement, which was followed by the use of manual trim on the control column. However, with the MCAS having moved the stabilizer trim by 2.5 units, the amount of manual nose-up trim using the control column switches applied to counteract the movement was around 0.5 units, or roughly only 20% of the amount required to correctly re-trim the aircraft. Because of the way the aircraft’s flight control computer P11.1 software worked, the use of manual trim using the control column switches also reset the MCAS timer, and 5 sec. later, its logic having not sensed any correction to an appropriate AOA, the MCAS activated again. The second input was enough to put in the full nose-down trim amount. The crew again manually counteracted with nose-up trim using the control column switches, this time offsetting the full amount of mis-trim applied by the latest MCAS activation. By then, some 80% of the initial MCAS-applied nose down trim was still in place, leaving the aircraft incorrectly trimmed. The crew then activated the stabilizer trim cutoff switches, a fact the flight data recorder indicates by showing that, despite the MCAS issuing a further command, there was no corresponding stabilizer motion. The aircraft was flying at about 2,000 ft. above ground level, and climbing. The crew apparently attempted to manually trim the aircraft, using the center-console mounted control trim wheels, but could not. The cut-out switches were then turned back on, and manual trim using the control column switches briefly applied twice in quick succession. This reset the MCAS and resulted in the triggering of a third nose-down trim activation lasting around 6 sec. The source says the residual forces from the mis-trim would be locked into the control system when the stabilizer cut-off switches were thrown. This would have resulted in column forces of up to around 50 lb. when the system was switched back on. Although this could have been reduced by manually trimming the aircraft using the center-console mounted control trim wheels, this did not occur, and the third MCAS activation placed the aircraft in a steep nose-down attitude. This occurred with the aircraft near its peak altitude on the flight—about 6,000 ft. The engines remained at full take-off power throughout the flight, imposing high aerodynamic loads on the elevators as the crew attempted to pull back on the columns. Vertical acceleration data also indicates momentary negative g during which the AOA sensor on the left side unwinds. This is seen as further validation of the theory that the external part of the alpha vane was detached as the apparent change in angle indication could only be explained by the effect of negative g on the counterbalance weight, forcing it to float up inside the sensor housing. In addition, the captain’s stick shaker also comes off twice in this final phase, further reinforcing the severed vane notion. The source indicates the crew appeared to be overwhelmed and, in a high workload environment, may not have followed the recommended procedures for re-trimming. Boeing’s stabilizer runaway checklist’s second step directs pilots to “control aircraft pitch attitude manually with control column and main electric trim as needed,” according to one U.S. airline’s manual reviewed by Aviation Week. If the runaway condition persists, the cut-out switches should be toggled, the checklist says. These two statements have me confused. Could they, or couldn’t they, re trim the aircraft manually? Or is the problem that they needed to unload the elevator first and did not know that? 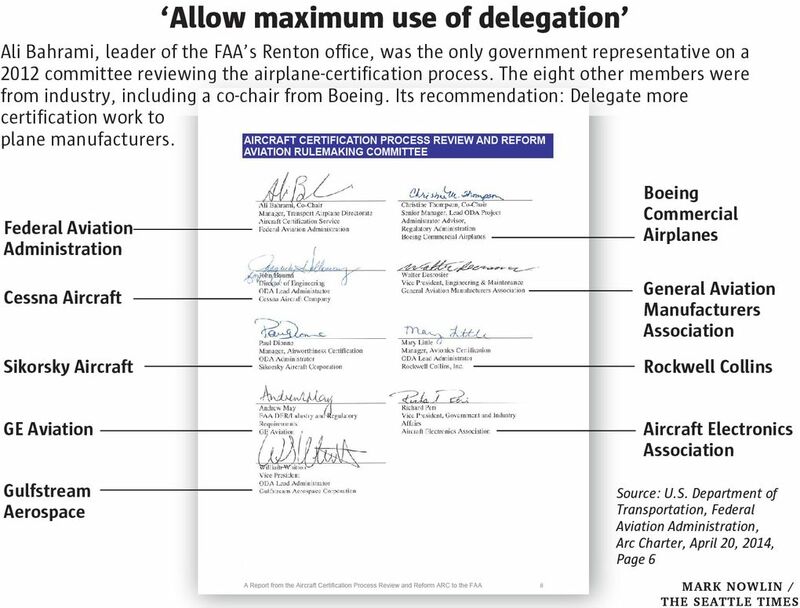 The terms “manual trim” have been sources of confusion and Boeing’s FCOM hasn’t made it clearer. For the AW&ST article, when referring to trim, the author accompanies the term, "manual" with a description of which manual trim is being used, the control column switches or the center console trim wheels. Take a look at the AW&ST article, re-posted with descriptions of which "manual" trim is in use, (red font). So, yes, they could trim the aircraft manually using the control column switches until they used the cut-off switches. Also, from what I have read, it's easier to rapidly turn the wheel, (handle extended), from the left seat than the right. This may have to do with simply being right or left handed. And yes, they could have used the manual (switches) trim right up to the end. This is verified by the albeit-tiny change, that the two manual-switch inputs by the crew changed the HS position. It takes 250 turns to go from stop to stop. It's the bits that are not said, that lead to confusion. Boeing's FCOM Bulletin states that "Electric stabilizer trim can be used to neutralize control column pitch forces before moving the STAB TRIM CUTOUT switches to CUTOUT". Missing; is it failed to WARN that the electric trim MUST be used BEFORE using the CUTOUT switches, in order to NEUTRALIZE the back force on the control column. This effectively means that if the aircraft is not properly trimmed before activating the CUTOUT switches, manual trimming may be impossible. My feeling is that the throttles were set for the projected climb, and the trim problem, UAS, stick shaker, warnings etc.. overwhelmed the crew, and eventually the increasing airspeed resulted in HS 'blow-back' - or HS stall. That's when the final AND occurred. Southwest have now removed 737 MAX flying from its schedules until August. Not sure if this has been posted...apologies if it has. Minor point, the Boeing FCOM wording is from the FAA Emergency AD's issued November 07, 2018 and December 21, 2018 as a revision to the AFM, (Airplane Flight Manual). It is obviously impossible to trim if the cut-off switches have been moved to CUT-OFF without trimming first, but the wording in the AD is to ensure neutral trim prior to doing so*. If I understand what you meant by, " manual trimming may be impossible ", I don't think trimming to neutral using the manual trim switches on the control column would be impossible purely due to high loads on the HS. Stabilizer 'blow-back' can occur with a "ball-screw" arrangement, (vice a screw-jack) but there are two brakes on the HS mechanism that are released whenever the electric trim or the manual-wheel trim is used. I believe that electric trim was available because there is slight HS movement concurrent with the last two blips of ANU electric trim, (resetting the MCAS which dutifully re-trims AND for ~6" resulting in the final dive). * There is no statement in the AD or the FCOM requiring that the procedures (in Fig.2 & the Runaway Stabilizer NNC) set out/referenced in the FAA AD are to be executed by memory. The FAA and Boeing leave it to individual airlines and crews to decide how to handle these procedures. I don't think trimming to neutral using the manual trim switches on the control column would be impossible purely due to high loads on the HS. Don, The trim switches on the CC are electric. The only way to trim manually is with the cut-out switches OFF and moving the stab trim wheel manually. I think WOODY was referring to the idea that if the Cut-OUT switches are turned off in a High Speed ND attitude (Not electrically trimming to a neutral attitude first), the manual effort of moving the manual trim wheel may be exceedingly difficult to achieve. As I expressed in my previous post to Turbofan, “Main electric” would of course be the control column switches." But that illustrates why I wrote the full descriptions in red font in the original post of the article from AW&ST - the article uses the term "manual" when referring to the trim wheels but conflates the term "manual" when applied to the trim switches on the control column because they're manipulated by hand even as they are controlling an electrically-driven, (primary) trim system. edited to add: There is further confusion regarding manual & electric trim - it is claimed, (but without verifiable evidence yet) that the manual trim wheels could not be moved. One theory is, "HS stall due high loads on the trim mechanism due high airspeed". But the trim moved ANU when the crew used the CC trim switches, (indicating, along with MCAS input, that the cut-off switches had been moved back to their normal position). Manual trim using the wheels doesn't work but electric does? Why? On Woody's comment, yes, got that too but probably didn't express it very well. It makes complete/logical sense that if the trim has run away due MCAS and nothing was done until time had passed, then when the trim is cut off by the CUTOFF switches, it freezes the system with whatever trim was in prior to using the switches. That's why the NNC states to trim neutral then cut-off the trim, (but, and Woody makes this point), the FAA AD doesn't emphasize the highly-critical importance of trimming the pitch to neutral right away and then cutting off the trim system. That's the key of course, and I agree with Woody that the wording is weak and buried, but it isn't confusing - it's just obscured in all the blather of the FAA's original and subsequent ADs. This goes back to the absence of any information and therefore training for a system that controls the most powerful flight control on the aircraft which has the potential for loss of the aircraft under certain, previously-latent conditions. I can't recall the exact number of full rotations one has to do manually for the full range of trim available but for my training experience I did fly an approach from 10000 feet to touchdown using just manual trim. The point here is that the max speed I had was 250 kts, backing off to final approach speed but I do recall that when gear and flaps were dumped it was rather awkward to get the correct trim on. I would assume if these fellows went to manual trim, ND, with the speed increasing and in that case it would be difficult to trim out to neutral due to the increasing air load on the HS.and if they felt that manual trim was not working, perhaps that is the reason for selecting STAB TRIM back on. Bear in mind, I was flying the T-Rex, (200), when the earth was cooling and best I can get out of the mental file cabinet was 40-45 turns to go from full ND to full NU. and if they felt that manual trim was not working, perhaps that is the reason for selecting STAB TRIM back on. Yes, I think that's a reasonable notion. On turns of the wheel, I've read that it takes 250 turns to go from full NU to full ND, (17°), or 14.7 turns for one degree or 0.068° per turn. That is not verified in any manual to which I have access, but if it's that, one can understanding giving the method up and turning the system back on again. If it's 40-45 turns for 17°, then its just over a third-of-a-degree per turn. I suspect the mechanical advantage, (ratio of 1 turn to how much the stab moves) would be small and the wheel would be very difficult to move. As shown in the traces with the last two blips of trim, the Pitch Trim parameter moves so the CC trim switches worked, which I believe is evidence that the manual method would have worked but not fast and probably not easily. - they had a long way to wind the trim ANU at ~15 turns per degree. I don't know how units and degrees relate - and I could be using "degrees" when it might be "units". Again, there is no information in the AMM, the AOM or the FCTM. Again, there is no information in the AMM, the AOM or the FCTM. Gosh, I don't know what's acceptable anymore conehead. We are in a period of great flux. As my brother, an electrical engineer, says with a smile, "That's the wonderful thing about standards: there are so many to choose from." To me anyway, the Boeing manuals I have experience with are thin on information. The details of what a control or indicator actually does and how it works are absent. I think there is less than even pilot-NTK information but that's just my view. I know the reasons, one of which Boeing itself stated recently with regard to MCAS. So, for the 250 turns, I have two sources...one was a PPRuNe post on the Ethiopian thread, and the other was a site where someone was building their own flight-simulator and made the statement regarding "250 turns". Kip's mental filing cabinet may very well be functioning perfectly! One way or another, people will find things out, fill stuff in or, these days it seems to me, with increasing legitimacy, just make up the information they want or need. It's always best that original, formal sources, (the manufacturers, the regulator, etc. ), share as much as they can when working in high-risk enterprises. Otherwise, trust in information, (and resulting behaviours) become an issue as we "choose" our standard then claim we've met it. Not a good way to do aviation, in my opinion. Until the MAX crashes, regulation of aviation safety in the U.S., where 2.6 million passengers fly every day, has been the model for every other country. The last commercial passenger airplane lost in a crash in U.S. airspace was 10 years ago. I just manually manipulated the trim (on the ground) from 0-15 units, min to max 250 turns. With no air load I ran out of steam less than halfway. They had their hands full, literally. Sounds like a work out.